It's time to take a look at the charedi response to the IDF operation in Gaza. There isn't enough information available to perform a proper analysis, so this post will be limited to surveying some reports that are available. It's important that people evaluate the charedi response accurately. There are many claims that are being exaggerated, while other stories are not reported. Still other stories appear to be fabricated; one of my mentors asked me to include the story of Rav Steinman crying over the soldiers at his grandson's barmitzvah. However, while this story received much publicity in Commander Uri Schachter's victory report, I could not find any corroboration of it (and surely Rav Steinman's grandsons celebrated their barmitzvahs many decades ago!). Instead, it seems to be a distortion of a different and not very relevant story about Rav Chaim Kanievsky. In documenting the various responses, note that I am only counting responses that genuinely represent the charedi world. Neturei Karta is not counted, since they are completely off the spectrum, have no wide following, and are despised by the rest of the charedi world. Likewise, I saw a claim for evidence of charedi concern from a certain "charedi" shul in RBS which sent care packages to soldiers - but almost every person in this shul grew up in a Zionist home and went to YU (and the people who initiated the campaign even have a son in the IDF), so they are not remotely representative of the charedi community. Abhorrent - Hundreds of yeshivah and kollel students gathered in Bnei Brak to hear Rabbi Yisroel Yitzchak Kalmanovitz. He spoke about how during this war, it is important to remain vigilant not to join with secular Israelis on either a practical or emotional level. He also said that one should not pray for soldiers (except religious ones), and that it is perhaps better that secular soldiers die al kiddush Hashem than return home irreligious. (Sources: Here and here). Disappointing - Here is a letter that I received: "My son was injured in Aza a few days ago (Baruch Hashem, he is fine and home and resting and recuperating). We spent the day in Soroka hospital yesterday with him. There were literally thousands of people who came by to visit the soldiers – bringing food, candies, gifts (backpacks filled with clothes, shampoo, shaving needs), toys, iPads!, ad bli di. People came from the tip of the North and from Eilat, celebrities and singers, chavrie Knesset, mothers and little children - you name it. However, with the exception of some Chabad and some Breslov, not one Charedi was among them." Unclear - Most Litvishe yeshivos followed a declared policy that yeshivah students should not take pleasure trips, on the grounds that it would be a chilul Hashem. It is unclear as to whether this was about genuinely identifying with the plight of the soldiers and sincerely putting into practice the much-vaunted belief that yeshivah learning protects, or whether it was about PR in light of the government plan to enlist yeshivah students - there are statements in both directions. Praiseworthy (to some degree) - Chassidic yeshivos and some Litvishe yeshivos said that they would cancel summer vacation while the soldiers were fighting in Gaza, which is a good thing - although, of course, still not equal to actually serving in the army. Praiseworthy (to some degree) - The huge Mir yeshivah was davenning, learning, and making tzitzis for the soldiers, as well as sending food. I classify this as "somewhat praiseworthy" because, as fine as it is, some people are presenting it as equal to actually sharing the burden of military service - which it isn't. When my sons go into the army, I don't want other boys their age to be learning for them and tying tzitzis for them; I want them to be ALSO serving in the army, so that my sons don't have to put in double time, double sacrifice and double risk! But it is nevertheless a praiseworthy act that is hopefully a sign of great things to come. Praiseworthy (to some degree) - Rabbi Yisroel Reisman, Rav of Agudath Israel of Madison, reported on many charedi women in Arzei Habira who prepared food packages for the soldiers, even if it meant using the chicken that was supposed to be for their own poor kollel families. I classify this as only somewhat praiseworthy for two reasons. First, as above, it still does not equal actually sending your sons to the army. Second, the report heaped praise on the "sacrifice" of the kollel families who are eating tuna instead of chicken, showing little appreciation of the infinitely greater mesiras nefesh being performed by the IDF. It said that "although we do our part in the ‘war effort' through Torah and Mitzvohs; we have not forgotten them who do their part on the front lines," giving the message that "We are so holy and special, but remember that the soldiers ALSO do their part." Whereas the reality is that the soldiers are doing vastly more, and at vastly greater personal sacrifice, than the people in Arzei HaBirah. Still, kudos to the women for doing this, even if their efforts are not being described appropriately. Conclusion: I think that the most striking aspect of all this is how diverse the response is. Normally, the charedi community is pretty homogenous. But here there is a tremendous range of responses. I would welcome suggestions as to why this is. The general trend, however, appears to be small steps towards a true realization of how much we need to value the IDF. Something is changing. "Amazing - Hundreds of yeshivah and kollel students signed up for an initiative to volunteer for the IDF in combat roles." What's amazing is that they think they're qualified to walk in to combat roles without the education or physical qualifications or conditioning. Most of them might just as well "volunteer" to perform brain surgery. I had the same kneejerk reaction. But if you follow the link, the initiative is a little more complex than that. Here's an anecdote for you. A couple of weeks ago the Mir held an alumni event in New York. One of the yeshiva's rebbeim spoke a bit about the matzav in Israel and mentioned that he'd been asked (or heard asked) about the pasuk "elef la'mateh, elef la'mateh" in Parshas Mattos. The pasuk, the meforshim explain, means that when the Bnei Yisroel went to war, they drafted out of every tribe a thousand soldiers AND a thousand daveners, who would go to the front WITH THE SOLDIERS and daven alongside them. So the question to this rebbe, naturally, was why are we not doing that too? Why is it enough to daven at home, or in yeshiva (surely the entire Bnei Yisroel was already doing that, yet a thousand daveners still went along with the soldiers)? The rebbe did not have an answer. He basically chuckled in a you-got-me kind of way and said "I don't know, but you see the regesh that people have! That they’re asking the question, because they feel for their fellow yiddin in sakanah!" And that was that. So, yeah. The question is being asked. Ad kan v’su lo. But seriously, imagine if the Charedim actually did this? Don’t go to the army, don’t ever be exposed to the Tzahal, nothing of the sort – but when battle begins, agree to sit in a tank and daven. Just be the dedicated davener. Our national problem of sinas chinam would be solved. Rabbi, I am sad to see this post, which could have been an opportunity to be dan l'kaf zechus and instead seems to be closer to the yetzer hara for ayin rah. Let's start by contrasting your extreme examples. You site a single Rav (of whom I thankfully know nothing) who spoke to a large group of people. Did they know what he was going to say in advance? Did they cheer and offer support for his position? If not the example is guilt by association. And, being that there is only 1 person clearly doing something abhorrent, I don't see how it can even make your list. Contrasting that with the "Hundreds of yeshivah and kollel students signed up for an initiative to volunteer for the IDF in combat roles" shows that there is a weighing system missing from this post. Other opportunities for dan l'kaf zechus are missing as well; do we know that those kollel women aren't already sending their kids to the war effort? I also find criticizing their statement unfair. If we translate into American terms, would a quote from an upstanding red-blooded American saying "We do our part at home, praying for the soldiers" be likewise viewed askance? What about the yeshivot that cancelled bein ha'zmanim? Why view that at motivated by anything other than a desire to support the war in a way that is extremely meaningful to them? Even if you are right about what is in their heart of hearts, without a way to prove it, what to'eles is there in casting aspersions? I will avoid the other examples so as not to appear picayune but, Rabbi, would you not agree that as a whole the nation has embraced, perhaps to varying degrees, an achdus heretofore unseen? Why then seek to undermine it? Isaacson, a respected Gadol speaking to hundreds of his disciples is arguably even more significant than hundreds of volunteers who are too afraid of community backlash to even publicize their names. "do we know that those kollel women aren't already sending their kids to the war effort? " Of course we know that, these women are from Arzei Habira and that was the whole point of the story. As to the rest of your objections - the point is to clarify the situation, not dress it up. You want to present things in a favorable light. Other people want an honest assessment. I have personally never heard of Rav Kalmanowitz; I think it is an exaggeration to call him "a respected gadol". He may be a gadol, and I imagine that those who know him do respect him, but he is certainly not well-known in the Charedi community. Yehudah Meshi Zahav had a telling response to your point- correct that he is just one rosh yeshiva who said something abhorrent. but his community did not reject him for it. and that says alot about his community. Why would anyone write such a post? At best it's pointless, at worst it's fueling sinat chinam and is lashon hara. One can see the wisdom and foresight of the hachamim that put the authors books in cherem. You don't think that people should be informed about what happens? How else are they supposed to know where to send their tzedakah, which yeshivos to send their kids to, etc.? And how is it lashon hara to report what a Gadol believes? please stop pondering about hilchot lashon hara and learn the halachot instead. This is pure unadulterated lashon hara, if not motzei shem ra. It's lashon hara to quote what Rav Kalmanovitz said, or it's lashon hara to say that many charedim are volunteering, against the wishes of many rabbonim? Laws of lashon hara were never intended to silence public criticism of public issues. I heard this from a Haredi rabbi that got some flack for cracking jokes about Israeli drivers. As the above commenter said, post like this which are "dan l'chaf chov" and ayin rah on charedim do nothing except to feed red meat to your anti charedi readers. It's fomenting sinas chinam pure and simple. Shame on you! Especially right after tisha b'av. Would you prefer people to be incorrectly informed, so as to preserve positive impressions? Yes. If this supposedly "incorrect" information hurts no one and fosters peace then why not? One can lie for peace. No one has lied. If anything, people have personal anecdotes that show true camaraderie. Pointing out a few negative cases and then being cynical about the ones that are clearly positive shows that you have an agenda and not a torah based one. To be quite honest, a blog that claims to be "rational" sure is good at rationalizing its lashon hara and hate. Nadine, I believe that the charedi approach is wrong, hence I believe that it is wrong to misrepresent it and thereby attract people to it under false pretexts. I believe that I was honest in my presentation. You, on the other hand, seem to be advocating for a deliberate slanting of things in order to "foster peace." Nadine and other indignant, do you hold this opinion for all Jews and I mean also non Orthodox Jews? I admire R. Slifkin because he goes out on a limb and explores, no stretches the limits of traditional Jewish thought. This blog has officially reached its nadir. Once a respected site where intelligent discussion of the rationalist rishonim was promoted, it has now become a veritable cesspool of all that is abhorrent. Plain and simple it has become a political attack blog of Haredim. The author approaches Haredim with a sort of paternalistic condescension, dogmically criticizing them for not completely agreeing with his Dati Leumi ideology. Take for instance his presumptous "classification" of certain Haredim's actions as "somewhat praiseworthy." Why do Haredim merit this honor so generously bestowed upon them by the blogger, because there sacrifices were not exactly the same as the sacrifices of the soldiers. Haredim would be impressed with such a dogmatic attitude! A poor kollel couple's donation of their only food to soldiers they do not know is deemed barely praiseworthy! This is sickening. Please, please, I beg you, return to the fundamental purpose of this blog, it is ill befitting of a man of your stature to engage in such fatous politicking. P.S. I am not Haredi nor a Haredi apologist, I simply realize that such posts contribute absolutely nothing positive. Fey, do you really think that when a kollel couple eats tuna instead of chicken, that should be praised as a sacrifice on the level with people who serve in Gaza? And if not, don't you think that when prestigious rabbis make that claim, they should be called out on it? And why should a Dati-Leumi blog not approach charedim from a Dati-Leumi position? Do you think that a charedi newspaper should not approach dati-leumim from a charedi position? 1. Took a leisure trip to Africa which included smiling selfies in a cessna, while holding a giraffe skin tallis bag and elephant tusks. Where is the sacrifice, the appreciation of the severity of the situation. (And no, writing a letter to CNN and a couple of blog posts does not count). So please, everyone, look in your own mirror and see what real sacrifices you made. So you are against all reports of what other people did during the war, or only negative ones? Don't you think that people should be informed about the nature of different communities, so that they can make informed decisions? I am against facile and politically charged accounts of what people did during the war. You make it seem as if all Rabbi Slifkin did was collect facts so as to allow people to make informed decisions, while in fact his account is tinged with subjectivity, bias, and distortion. This can only be harmful. And pray tell, how does this post help people make informed decisions, unless you are saying that base appeals to emotion are more important than showing that one side, based on a discussion of the sources, is either correct or incorrect. This is highly ironic coming from a rationalist blog. Not a single charedi family "sacrificed their food", because it was never theirs in the first place. They're living off the tzedaka of others. Essentially they did nothing more than, for once, give a little tzedaka of their own. Hardly a sacrifice. Look Fey - you're entitled to hold a charedi opinion. A lot of uneducated people do, it's nothing new. But you can't talk about "entrenching" viewpoints, and "being harmful" and "loshon hora" and other such nonsense, unless you write weekly letters to the Yated Neeman telling them the same thing. People speak and write from their perspectives - you do, I do, Pinny Lifschitz does, and Rabbi Slifkin does. And of course this is agenda driven, what other type of writing is there? You don't have to like it, but your complaints are meaningless. Your immature potshot at Haredim is saddening. If I was Haredi I would almost be insulted. What that simply shows is: 1. You cannot even fathom that those of a Non-Haredi disposition would ever sympathize with Haredim over Religious Zoinists. To this I simply say, you really need to leave your echo chamber. 2. You cannot fathom that "educated" people can come to the conclusion that Haredi'sm is correct. This is very sad, and is part of the reason I no longer indentify with the MO/Dati Leumi community, it has become associated with all that is repugnant, with a certain presumptous, moral certainty, and self righteous hypocrisy. Much more undertanding and nuance can be found in the YCT world. As for your second point, If you are promoting willful distortion due to agenda seeking bias, I really have not much to say, its silliness is self evident. "This is very sad, and is part of the reason I no longer identify with the MO/Dati Leumi community..."
Oh, please. Who do you think you're fooling? Perhaps you're also one of the seminar callers who say "I used to be a Republican, but this year I'm voting democrat because etc. etc." Come on, grow up. Unlike you, I don't have the time to sit around posting comments all day long. Perhaps you're in kollel, supposedly learning, and do. Or maybe you're off on you're four week summer vacation. In any event, you can post dozens of comments here till you're blue in the face, as in fact you seem to have already done. 25 x 0 = 0. Gershon, once again your comment speaks for itself. When you are ready to have a serious conversation, please notify me. Why all the petty swipes? The sarcasm? The hatred and animus? It really is unbecoming of someone who seems to take himself seriously. I also find it rather amusing that you assume I am a Haredi in Kollel, as if an educated Modern Orthodox Jew could not possibly disagree with you. I have made some slight adjustments to the post. But if you prefer to see these reports from an extreme charedi perspective, just switch the descriptions at the beginning. I.e. followers of Rav Kalmanovitz would see his presentation as amazing and the IDF volunteering as abhorrent. Mainstream charedim would disapprove of Rav Kalmanovitz's speech, but would simultaneously not praise the volunteer initiative. Etc., etc. Rabbi Slifkin, I take issue with your report of the last "Praiseworthy (to some degree)" about the women of Arzei HaBira. Based on what you wrote, I am guessing that your information comes from a certain newspaper article in the Friday, July 25, 2014 paper. Unless you can verify any of the information you wrote on this post, if it indeed comes from said article, then there are many inaccuracies that need to be addressed. Firstly, the article is written by a third-party Rabbi, who is "reporting" on the "matzav" in Israel. He deems it prudent to mention an email that Rabbi Reisman sent out to his congregation (which the third-party Rabbi (who is not in NY) heard about from a friend). As Rabbi Reisman was in Arzei HaBira when the women decided to prepare food for the soldiers manning Iron Dome batteries, Rabbi Riesman's shul PAID for the actual uncooked food which the women of Arzei HaBira cooked. There is NOTHING about "sacrifice" being made by kollel families! If anything, this shows that AMERICANS "contributed" to the war effort in a very real way. (Though this act of chesed, while meritorious, is questionable if this is contributing to the war effort. Providing soldiers with BETTER food, while nice, is negligible when it comes to fighting the enemy. And if you will argue that it indeed helps the soldiers perform their duties better, then why isn't this a viable form of alternate-service in the IDF for the Chareidim?) I am not de-legitimizing the women of Arzei HaBira, but the facts are that there was NO SACRIFICE on their part; they but cooked the food for the soldiers. It was the Americans who provided the means for this. Rabbi Reisman "shared" this story with his congregation, obviously because some of those congregants donated money for this effort. For starters, we are told that because they live on tight kollel budgets, this often means "happily giving up eating chicken or meat daily for the sake of a spiritual life of Torah." Yet we are told that they "sacrifice" by taking chicken that is being saved for Shabbos or a special piece of meat that is being saved for a special occasion and sent it to the IDF. I question the halachic qualifications of this supposed act of chesed. If they do not have food for their family, it is 100% assur to give away food that they need to charity (learn the laws of tzedakah). If they are sacrificing their enjoyment of Shabbos when they don't have otherwise, they are NOT ALLOWED to give their food away. How will their children feel? Already living meagerly, they are expected to live with even less by a warped rationalization that an act of chesed was performed? If indeed the children are lacking, then as I said before, it is assur for them to give away their "meager portions". (And they are teaching their children anti-halachah practices.) And if they are not lacking, then what is the "sacrifice"? Rabbi Slifkin, you mention in your post that "the report heaped praise on the "sacrifice" of the kollel families who are eating tuna instead of chicken", and the newspaper article that I believe you are quoting from states "or they used that night's chicken, which would have been dinner for the family, and substituted tuna fish for their family's dinner." This though, is an inconsistency. As I showed above, we are first led to believe that the "tight kollel budget" prevents from having "daily chicken", and yet here we are told that they "sacrificed" that night's chicken. But I thought that the kollel budget was too tight to afford chicken (accept for Shabbos we are led to believe)? Do they have the money to buy chicken (not for Shabbos) or don't they? And once again, the priorities of tzedakah mandate that one's IMMEDIATE FAMILY takes precedence above all! If they are not providing the basic necessities to their children, they are NOT ALLOWED to give their children's food to others. The glorification and heaps of praise of this "chesed act" is actually related in the third-party Rabbi's own words. It is an ABSOLUTE FANTASY to which we are supposed to believe that such a conversation went on in some anonymous kollel family household. This is the fantasy that the Chereidim would have us believe, and it is just plain old propaganda. Halachicly it doesn't work; either they are "sacrificing" their meager portions which is assur, or they have enough and there is no "sacrifice". Another inconsistency with the report: "In a matter of minutes, hot, fresh, home-cooked meals, complete with fresh bread and cakes, were carefully cooked and baked and wrapped ... and were ready to be delivered." Really? In a matter of minutes?! Well then, it can't be talking about the supposed "special piece of meat for a special occasion or chicken for Shabbos", as those take longer to cook than a few minutes, not to mention that they must have been in the freezer (and take even longer to cook) since they were for some future date. Lest you claim I am arguing over poetic exaggerations, my point here is that the whole article just doesn't stand up to facts, and is just a piece of Chareidi propaganda. Fresh bread and cakes? If they were to home-make these, it would take much longer than "minutes". And if these were store-bought goods, I will repeat my point that I made above. If the kollel families really have a too tight budget, then these items are the bare necessities of their families. It is ASSUR to give up their meager needs (and those of their children!) to other people! I think they really need to learn the laws of tzedakah. And if you will tell me that they have enough, then where is this supposed "tight kollel budget ... which means giving up eating ["delicacies"]... for the sake of a spiritual life of Torah"? Yet another inconsistency: "There was no talk of whether these boys were religious or not..." and "No one cared if these boys were chareidi or dati or chiloni..." These statements could not be more absurd! If the Chareidim are supposedly leading a life of Torah, do they know nothing of chesed?! IF this instance mandated charity (and as I pointed out above, I'm pretty sure it did not), then when it comes to chesed, since when is one's observance taken into account? Even if the person in need was a gentile, and you had the means to help him (and were halachicly obligated to; not counting enemies, beggars that will just use your money to further their addictions, etc. ), then of course you are mandated to help him! And if we are talking about Jews, one should extend chesed EVEN MORE to the non-observant! This completely non-Torah belief of Chareidim that "I only give to my own" is completely contrary to the very Torah they profess to believe in! If they are not obligated to give to the soldiers since they are much farther down the list of people who one is obligated to give ONLY IF one has the means, then how can they glorify this "act of chesed"? They are not obligated to give them! As you can see, the inconsistencies abound. Rabbi Slifkin, I believe you quoted the article from the newspaper in the above post saying: "although we do are part in the 'war effort' through Torah and Mitzvohs; we have not forgotten them who do their part on the front lines." This is a direct quote from the FANTASY written by the third-party Rabbi, and has absolutely nothing to do with Rabbi Reisman (just to clarify for your readers). The third-party Rabbi speculates on a reaction from the soldiers (incidentally, we are never told how the soldiers who received this reacted). And Rabbi Slifkin, I think you missed out on a crucial point: the beginning of the sentence that you quote, which starts "we have allowed Jewish soldiers to enjoy a home-cooked meal ... WHICH REMINDS THEM that although we do are part in the 'war effort' through Torah and Mitzvos, etc." [emphasis mine]. Which REMINDS THEM?! As previously mentioned, we are not told of any of the soldiers reaction; we are just privy to a fantasy of chareidi propaganda. As can be clearly seen, this is what chareidim (or at least their leaders) believe. Rabbi Slifkin, I agree with your assessment of the quote, however, I think that when fully analyzed, it is apparent that their "mitzvos" that they are doing (these supposed acts of chesed) are actually aveiros (violating the laws of tzedakah; not to mention other practical ramifications of the chinuch of their kids, shalom bayis, etc. ), and their Torah that they are learning to do their part in the 'war effort' is clearly not being studied properly, otherwise they would see the error of their ways. I won't comment on some of the other fallacious statements in the article, as they are not pertinent to this post. I was quite surprised when I saw who wrote the article; that Rabbi is usually a good spokesman of Israel, and I could not believe that he has sunken or was bribed into peddling chareidi propaganda. Rabbi Slifkin, if you can verify the reports of the article by other means, please do so and let us know and your source. If however I am right in the original source that you got your information from, I think it wrong for it to be presented as a marker of the chareidi response to the war (as praiseworthy). Rabbi Reisman's congregation is praiseworthy for funding the food for soldiers, yet they are not chareidi (this would fall more under the response of chutz la'aretz people), and clearly have the means to donate tzedakah to those in need in Israel. The rest of the article and the subsequent quotes in your post are indeed chareidi, however, as I labored to show, they are not at all praiseworthy! They are telling of a warped rationalization of anti-halachic practices, and the reports of this all comes from a very inconsistent chareidi propaganda news piece which doesn't stand up to facts. I would appreciate if you could (yet again) modify the post. Rabbi Reisman's congregation is praiseworthy, yet it is not an accurate portrayal of a chareidi response to the war. The rest of the article is, however it should be demote to "Abhorrent". What is abhorrent is the propaganda, the way the actions are portrayed, the numerous abhorrent and inconsistent things that I mentioned above, and that chareidim rationalize their warped beliefs in the way that you quoted from the article. When my sons go into the army, I don't want other boys their age to be learning for them and tying tzitzis for them; I want them to be ALSO serving in the army, so that my sons don't have to put in double time, double sacrifice and double risk! Precisely. When I think about the enormity of what my wife and I invest every single day with each of our kids, on every level - physical, emotional and otherwise, being ever so careful about every detail of their lives - the LAST thing I would possibly want to do is put my precious sons at risk of life and limb, exposing them to the hell of war, witnessing bloodshed and death, going head-to-head with terrorists. It's literally a living nightmare. Yet I know it would be immoral not to be prepared to do that. No, not everyone is cut out for actual battle. And there are plenty of other jobs that need to be done in the army, after all. I don't know what my sons will choose - some may be fighters, others not. Either way is okay by me. But that's an individual decision, NOT a communal one. It is wrong for a whole sector of society not to assume the same risks as everyone else, even if they believe they are making other contributions. If I can add a point, there is the backhanded avoidance. The leading American charedi spokesman just wrote about the situation in "Eretz Yisrael" and the soldiers who "protecting their friends and relatives by fighting evil." Funny, I thought there's been this thing called "the State of Israel" that's been around for over 66 years. I thought those soldiers are defending *that*. Another post I saw referred to the three kidnapped teens without mentioning the soldiers killed as well. No, I'm sorry. I can't accept talk about "the matzav" or "the sakanah" or "yidden" or "Jews" or "friends and family" or "Eretz Yisrael" or anything like that. The State of Israel is under attack and people are defending it; you can at least admit it. Nachum, I do not understand your position. You would rather Jews frame their concern based on a secular abstract notion of the state than much more emotional, personal, and concrete based frameworks such as yidden, friends and family, or Eretz Yisrael? Truly it has been pointed our that throughout history, soldiers fight not for the "homeland" but for their buddies. Of course everyone is concerned about fellow Jews, friends, family, and the Land of Israel. But the IDF and the State at least rate a mention, as if history wasn't frozen in 1900 or so. Perhaps I don't know the context of your complaint. Are you referring to how Haredim expressed their sympathy for the plight in Israel? If so, why should we expect them, or think it neccasary, that they frame it in a way that feels most authentic to them is all we can expect. Well, I can hope that they come to feel differently. A state is an important thing too. If you mean the modern-day nation-state than no. It is a 19th century creation. A homeland though is important. And I think that why they use Eretz Yisrael as opposed to Israel. How very post-modern and left-wing of you. States are as old as history. Nachum, calling me post-modern and left-wing does not detract from my point. Nation-states are not as old as history. This is something anyone who took a international relations or comparative foreign policy class would know. They are an aspect of the modern international system which most theorists place as having emerged during the 19th century. I've taken both, thank you very much for the condescension. The fact is that stripped of all your qualifiers, states have always existed. David HaMelech's troops fought for a state. I read somewhere that the IDF has way more food donations than they need, so it's a shame that poor families sacrificed their meager food. Perhaps these donations did more to give the donors a feeling of participating (however peripherally) than to actually help the soldiers whose lives are on the line? I was in a Yeshivah that today would be called Haredi (I don't recall the term being used then. Although officially unaffiliated, the Yeshivah described itself as "Agudah type".) during the Yom Kippur war. The Israeli students were encouraged to stay in Yeshivah during the post-Yom Kippur bein hazemanim, rather than go home or on outings. The reason was to avoid being conspicuously not in the Army when the entire rest of the nation, including reserves and civilian trucks and buses had all been called up. It was not to contribute to the war effort though additional learning or chassadim; there were none. They were just off the streets and out of the public eye..
rabbi slifkin, why are you not responding to Fey's points? Has he left you speechless after being exposed to be a complete hypocrite? JT, what does your experience of 40 years ago have to do with the situation nowadays, where, so very clearly, the yeshivot that cancelled bein hazmanim did so because they thought it would help Israel win the war? I learned in the most mainstream, some would say prominent, Chareidi Yeshivos (Brisk, Lakewood) and follow the Chareidi news. I have never seen or heard of that Rav before. I would love for anyone to find his name mentioned anywhere, any Chareidi site or newspaper, before considering him newsworthy. He is not well known but those who know of him regard him very highly, or I should say are awed by him.You also don't address where you stand in regard to his views. Below, Yitz Waxman August 7, 2014 at 6:11 PM indicates that this Rabbi's views are amply based in Torah sources. And ברשות בעל הבלג נר"ו, I invite you to please contact me via my blog to have a constructive discussion of this. Thank you. 1. What concrete sacrifices did you make during the war and do you regret going on leisure vacations while most of Israel was under constant terror? 2. You have complained on this blog time and time again that the problem with Haredim is that they are not consistent and do not really believe their learning does anything. When we see concrete evidence that they really do believe so and in fact act upon it, you suddenly change your tactic to be not that Haredim are inconsistent, but that they simply don't agree with you. Which one is it? I don't normally respond to personal questions, especially not to people who don't even give their name, but I will make an exception here, provided you also answer the same questions. 1. I donated money to IDF causes. I will be sending my sons to the IDF, even though it fills me with terror. What concrete sacrifices did you make, and will you be sending your sons to the IDF? I did not go on leisure vacations. I am on speaking tours. Surely you are not suggesting that I should have cancelled them? 2. I have not seen any concrete evidence that the charedim really believe that their learning protects. They fled the south and they did not go to learn among the soldiers, as their alleged sources recommend. Furthermore, this has always been a separate criticism from the fact that learning is in any case not a heter not to serve in the army. Now I await your answer to the same questions that you asked me. Since R' Slifkin (and most Israelis) know what actually protects Israel, yes, he is free to relax a bit during a period like this. I assume he said extra Tehillim and tefillot and learned in the zechut of those fighting. Charedim, who claim (ostensibly) that "their learning protects" have no excuses: They are obligated to learn as much as they can and cancel all leisure during these periods. Otherwise they are revealed as dishonest. "I have not seen any concrete evidence that the charedim really believe that their learning protects. They fled the south"
That's simplistic; there are so many other needs for protection in soceity and also learning is affected in the south. More Israelis die annually from road accidents than the amount killed annually at the height of the Intifada. Each year 8,000 Israelis die because of active and passive smoking - more than the number killed in war and terror over the past 50 years combined. There's so much natural danger, dwarfing whatever danger exists in Gaza. The danger of the Iranian nuclear bomb we don't want manufactured is least in the south (periphery). This is without taking into account the spiritual dangers. If we believe Torah is protective and n many ways, and that Torah learned in formative years aids Torah study of an individual for years to come - to be past over to generations -. Then there's all the reason to believe that Torah students during a war should be were they can concentrate best. You have to see my previous posts, where I proved that the belief that Torah protects is related to the place where the Torah study is being done. It was meant as a response to those posts. My points being 1) the dangers localized around Gaza are dwarfed by other constant day-to-day in society as a whole (including accidents, Iran, cancer, spiritual dangers..) 2) You must also take into account that actual learning may be of lesser quality in a pressurized danger zone. In other words, as the guy above reflects the charedi worldview, "Torah Protects - EXCEPT when it doesn't." Why not come up with the other classic dodge, שאני מקום דשכיח הזיקא? That's the classic excuse offered to explain away everything. Gimme a break, buddy. The "Torah Protects" thing is baloney. Everybody knows it. Guys like you that believe in it are the "useful idiots" Lenin used to laugh at privately. The young naïve left-wingers who actually believed the propaganda he and the leadership dreamed up to promote their ideology. Possibly rabbi slifkin resorts to bashing charedim because it gives him moral certainty. Rabbi, do let us know when you have calmed down enough to cease censoring my comments on the children of Gaza. Yeah, right. And what about the 400,000 charedim and wannabe-charedim who rallied in Jerusalem six months ago and declared "shefoch chamoscha al hagoyim" about the Israeli government and its supporters? Interesting... this would make for a fascinating study: Those that adhere to any fundamentalist viewpoint appear to have a tendency to dehumanize their opponents. Moniker, do you know of any research on this aspect fundamentalism? 1. I am not suggesting that you should have cancelled them, merely that taking selfies in a cessna is an innapropriate activity while your brethren in Israel are under constant threat and terror. 2. How can you say that you see no conrete evidence that they believe their learning protects? They cancelled bein hazmanim!! And furthermore, it is pointless for you to be disappointed or upset that they disagree with you about the nature of the heter. I can understand your critique from inconsistency, but to be upset that they disagree with you seems childish. And if that really is what bothers you, marshall the sources, don't simply foment against them. Before I answer the questions I would just like to say that I bear no animus towards you, I simply think that this blog has strayed far from its original purpose. If my comments were pointed it was not because of a hatred towards you. I respect a lot of what you do, I think that sometimes you go to far in your attacks against Haredim. 1. I donated money to IDF causes. I have volunteered at pro-Israel watchdog organizations and wrote published research reports about anti-Israel foreign funded organization which were presented to the the UK and various foreign diplomats. If I ever move to Israel, I will most certainly push my children to join the IDF, although I would not be too upset if they did sherut leumi in a hospital instead. I, however, do not agree with you that every single person must serve in the army on equal terms. There are many ways to contribute to the cause of the Jewry in Israel, for some it is 3 years of combat service, for others it may be radically different. Either way, as I have not been publicly criticizing Haredi responses to the crisis, I think that I am not as subject to claims of hypocrisy. When I criticized your vacations, it was to make a point, that being, that someone can easily twist your actions as being callous and abhorrent, when in fact they may not show the whole picture. I think you should have the same perspective when you are reporting on the activities of Haredim. I took the photos in Africa before things had gotten bad in Israel. I think that I am more sensitive than most to the suffering there, since my own family is directly in the line of fire and has been attacked. And unlike you, I actually live in Israel. No, I don't see cancelling of bein hazmanim as concrete evidence. First of all, there is JTs comment above. Second, they themselves present sources about the protection being in places where the learners actually are. Third, as noted, the oft-quoted Mdrash says that the learners should go to the front lines. Doesn't the gemara in makkos 10a say that "the torah learned in the gates of jerusalem " helps win the war? it doesn't sound like they need to be at the front lines. Yes, that is the only source in that direction. All the other sources indicate that it is geographically related. To believe JT's conspiratorial suggestions is simply a reflection of your bias. I mean seriously, you have a choice here to either accept Haredi acitons at face value and you would choose to adopt conspiracy theories? That being so, why do you think they cancelled bein hazmanim. You perhaps can argue cogently that their method of learning does not correctly serve as protection, but certainly that is not the same as saying they do not believe it protects. And so, I think you have to come to the conclusion that they do indeed believe it so or you are forced to accept JT's conspiracies, which, once again, would seem to fly in the face of a rationalist disposition. We have a phenomenon that has two possible explanations. I mentioned both possibilities and did not favor one over another. JT is giving a report attesting to one explanation as being correct. Furthermore, I have seen statements directing bochrim not to take vacations because it will give ammunition to those trying to force the draft - i.e. not because their role in the war is to learn. So there are two possible reasons to believe in one explanation, and yet you prefer to believe in one over another. And you are accusing me of being biased for even mentioning both possibilities? I am a student learning currently in the mir and i was personally in attendance at the rosh yeshiva Rabbi L.Z. Finkel's shmuz to the entire yeshiva where he stated clearly that there were 2 reasons that the zman was being extended. he said this, i was there. why not take his words at face value? JT's report is from 40 years ago and has absolutely no bearing on the current circumstances. The yeshivos who have cancelled bein hazmanim have stated publicly that the reason they do so is because learning torah protects. To not take them at the word is to descend into the pit of conspiracy theorizing, which for me, coming from a rationalist perspective, is a less likely possiblity. And yes, to mention both as equal possibilities reflects bias, for one is clearly a conspiracy theory, the other taking people at their word. Sure, so in that case, maybe (1) was indeed the primary reason. That doesn't mean that it's the primary reason in every case. In my post, I didn't take a position. and this is 3 days ago, not 40 years ago. "JT's report is from 40 years ago and has absolutely no bearing on the current circumstances." "The yeshivos who have cancelled bein hazmanim have stated publicly that the reason they do so is because learning torah protects." I have seen statements (citing Rav Steinman) which ONLY mention not doing pleasure trips (but not that they have to continue learning as usual), and which ONLY mentioned the chilul Hashem aspect and harm to the anti-draft cause. It wasnt just a throwaway comment that learning protects, he spent 30 full minutes stressing the importance of learning for the safety of klal yisrael during a milchama. it was not just to be yotzay saying it. Great, so in that case, (1) was indeed the primary reason. That doesn't mean that it's the primary reason in every case. In my post, I didn't take a position. Incidentally, if you have access to him, perhaps you can ask him about all the sources which indicate that the protection is geographically concentrated where the learners are. (They are listed in a number of my previous posts on the topic.) Also the midrash about the learners accompanying the soldiers to the front lines. you know what, i will ask him (and i will report back to you), and I'm sure he'll have some response. but thats not the point. the point is that he is the the head of one of the largest and most prominent charedi yeshivos in the world and he says that he truly believes that torah learning is vital for our safety. you can disagree, but you can't demonize them for believing in what they hold to be true. Great, I'm glad that you'll ask him. You can find some of the sources at http://www.rationalistjudaism.com/2014/03/torah-army-and-bizarre-chess-analogy.html. The other source is the Midrash about the thousand people praying accompanying the thousand people fighting. But I did not "demonize" them for believing this! I criticized (A) those yeshivos which are only avoiding pleasure trips for PR purposes, and (B) more generally, those who avoid army service, and (C) those who claim to believe that Torah protects but do not follow through with this doctrine. Do you criticize poskim who believe that brain death is not death and therefore do not permit the donating of certain organs? No. This is called a disagreement over the sources, nothing more and nothing less. Those poskim are not evil, they simply believe the sources bear out that it would be murder. If you now agree that at least certain Haredi institutions are internally consistent in their views, I don't see now you can criticize them any longer. It is merely a source based dispute now. It's funny, I used to think exactly the same as you. 18 years ago I wrote a long essay justifying why charedim don't serve in the army, and I stressed that it's just a dispute over the sources. Gradually I realized that it's really not the case. The sources here are a post facto rationalization (and not a very thorough one) for their not wanting to serve in a ZIonist army that is spiritually dangerous. Interesting. What led to your realization? If you believe this to be so, shouldn't your method of attack relate to trying to convince Haredim that the army is not spiritually dangerous? Or to make it less spiritually dangerous for Haredim? Also, I would like to distance myself from the first part of your comment. I am not justifying Haredim not performing service. I think there position is incorrect, but I am willing to concede that its logically consistent and not impute nefarious agendas to them. Several things led to my realization, including that there was never a carefully developed investigation of the halachah, and that ideas about "protection" were entirely inconsistent in their application. I think that the army is indeed very spiritually dangerous for charedim, and I understand their concerns. I just don't think that these concerns justify placing the burden on everyone else's shoulders. Out of curiosity, why don't you think there concerns justify placng the burden on everyone elses shoulder? Is your belief based on sources or feelings? Moreover if this really so, I would think you should thrust most of your efforts into trying to create a spiritually safe option for Haredim in the army, not bashing them for what you think is a fairly justifiable position. Moreover, why do I see no criticism on this blog of those that have created this atmosphere of debauchery in the army and have scared away the Haredim? As I understand it, this blog has a mandate to serve as a polemic against Haredi shortcomings from a religious perspective. Fixing the army's spiritual problems is not part of that mandate. More significant is that the Haredim have a vested interest in maintaining the army's status as a spiritual wasteland. That's why programs such as Nahal Haredi and the new high-tech hesder (or even national service behind the lines) receive such resistance. The last thing that Haredi leaders want is a religiously safe IDF. Yitz, Rabbi Slifkin believes that the Haredim justifiably have what to be worried about regarding the army. I am still awaiting a response as to why he doesn't fully respect their fears. Nevertheless, I would think the most productive thing he could do would be to polemicize against the spirirtually dangerous IDF, not the Haredim whom he actually believes have legitimate concerns. As for your second point, why do they have this vested interest? and how do you know this to be so? It seems like whatever nefarious agenda you impute onto the Haredim would undercut Rabbi Slifkin belief that what really concerns them is a religiously safe IDF. I continue to be astounded by the amount of conspiracy theorizing on a blog dedicated to rationalist Judaism. I was not granted an audience with the rosh yeshiva today (i will keep trying) but i did do an informal survey of other chareidim in the mir. I found that rabbi slifkin is partially correct. Everyone i spoke to said that they genuinely believe that torah learning protects the soldiers and the nation from harm. Again, you can disagree, but thats what they truly believe. On the other hand, most said that this was not the real reason that the chareidim don't go to the army (ie. its not the reason that the gedolim have se t the charedi tzibburs policy as such). Rather, the reason is because joining the army would (for various reasons) destroy the chareidi way of life. Many people don't see that as a problem (aderaba, its a good thing), but they certainly do, and they think its worth not sharing the burden to maintain what they think is authentic judaism. So again, it just boils down to a source based argument as to what is authentic judaism. As we all know, rabbi slifkin disagrees vehemently with the chariedi position, which he is certainly entitled to do. But there is not point in critisizing/demonizing them unless you can prove that they are inconsistent with their beliefs or are ignoring the blatantly obvious. Other than that, you can just argue with them. As for your issue with torah protection being geographical, everyone i asked said that ideally they should be joining the soldiers on the front lines but that its highly impractical for that to happen (do you think the idf would let it?). The next best thing is prey and learn for them from afar which although not as effective, it still works (they brought makkos 10a as proof. It also just makes sense). The mere fact that there were yeshivas that cancelled bein hazmanim is a huge difference between this war and Lebanon II. What is wrong with the Chillul Hashem reason? It is also a step forward to realize that it would be one, rather than just assuming that everyone would understand that they learn so hard all year, and anyway can't be of any help in the actual fighting. So this is also a step forward toward identifying with the rest of Am Yisrael, and that is huge in and of itself. Another point that may be worth making is the Kikar Shabbat web site, which for the last few weeks has been indistinguishable from Arutz Sheva's site - they wrote about all the injured soldiers, posted all the videos of soldiers dancing, published every bit of IDF's reports. If the first step toward fairness in service is identifying with the service people, than this is a very big step forward. Yes, we would all like there to be a large and varied set of programs in the IDF that allows people to combine service with learning, with volunteering, with any number of things, something suited for all members of Am Yisrael. Patience. Thanks for ruining my 10 Av. If I've learned anything in the past 3 weeks, it's to avoid looking for a fight within, and instead celebrate so many miracles and positive outcomes bein adam l'chavero that were the result of this astounding time. I believe it is also important to note the charedi response in the US. Recently I had a discussion with an Israeli Labor member who hates the religious. We were discussing the army and he made it clear--from jobnik to combat there is an excess of soldiers. From all the people who served that are personal friends I hear the same. True it's wonderful to serve and protect. But a certain amount of time is required for proficiency in the army and that is never going to disappear. As many people who will serve, nothing will change in that regard. In fact, as it becomes more expensive to run the army, the concern should be that the soldiers are truly getting enough training. All this I write because your post is denigrating the solidarity shown. The newfound cohesiveness. Assuming the Yeshivot not closing is not a mere PR stunt, it should be applauded for its standing up for the belief that Torah protects. The women, who generally don't serve in any significant role in the army anyway, that sacrificed for the soldiers shouldn't just be somewhat praiseworthy, but truly praiseworthy. Beyond the report on Rabbi Kelmenowitz and the mass volunteering, I wonder what the true point of this post is. There has never been a decision of the state of israel determining that there are too many soldiers. Only the sate can make this decision - not a private MK or a personal view of an ex-general. Only the State. A self-selected group certainly cannot exempt itself from military service based on this. So it's high time the charedi world stopped spouting this. It is legitimate to discuss the efficacy of a professional standing army versus a uniform draft. That is legitimate. But even a Moshe Feiglin who supports going to a professional army will agree that while the draft is in place no one has the right to self-selectively exempt out of it. For that matter, I do object to R. Slofkin's suggestion that his son will do double time, double risk. The army will decide who does what in the army. The army evaluates all candidates and decides who goes to combat, who goes to elite units, who goes to intelligence, who goes to the spokesman, who get acadmic traning first and then serves, who becomes a cook, and who gets exempted due to lack of need or unfitness to serve. No one else. So the children of charedim need to go to the army because as citizens of the state and and members of am yisrael they have to do what everyone else has to do. In this repsect the story that you described as "amazing" is actually very triubling. It plays into the charedi propaganda that "during times of war theer have always been charedim who served". This claim usually gets propped up by pictures of chassidim with black hats holding sten guns during 1948 war or picture of chassdim in unform holding arba minim during the yom kippur war. this is a complete fallacy. again - the people have decided that in order to defend the country and teh jewish people the country needs an army with soldiers who serve for a fixed term and then various levels of reserve duty. ONLY the army can decide where people should go. Citizens can;t decide on their owmn that because they belong to X grouo they will only serve during war time or during periods of crises. The system and the social cohesivness udnerlying the system will fall apart if that is the case. As a Chareidi in EY there's definitely much appreciation of the soldiers in Gaza (in-spite of the lack of appreciation for what we're doing). You mention the lack of homogeneity in responses. You should have the nuance the responses you report are generally not necessarily mutually exclusive; one can have much gratitude to a soldier risking his life, but still hold that it's not in his best interests that he continue a life of Chilul Shabbos B'farhesyia and that cultural/emotional distance to secular is a good thing. Re "Disappointing ", if you have any understanding of Chareidi life - which you should - it has to do with cultural gaps (arguably laudable) rather than a lack of appreciation. - what lack of appreciation are you refrring to? and what are you doing? - one can accept cultural distance. emotional distance is a clear sign that the charedi community (or at least those that feel that way) was "poreish min hatzibbur" and have lost teh essential connection that binds all Jews. Charedi ideology trumps national cohesiveness which has bound Jews for centuries. - what are teh cultural gaps? I have a very deep undertsanding of charedi life. I personally spent a weekend with a family member hospitalized at a cancer hospital, and received support from - amongst others - viruntly anti-zionist satmar chassidim and their bikur cholim society. Charedim LOVE going to hospitals to help sick people. And they almost always NEVER distinguish between different types of Jews when they do. It is always highlighted as one of the major components of charedi volunteerism - zak"a, hatzalah, volunteering hospital wards. If it has beepers and red/white sirens or logos - charedim love it. So if anything, the absence of charedim at the hospitals in terms of the IDF soliders being hospitals speak volumes about the sickness which has pervaded charedi society in terms of their relationship to IDF soldiers (campaigns against hardaki"m; graphics of soliders burning torahs; pictures of government ministers in SS uniforms at Auschwitz trampling charedim kids; drawings of charedim being attacked by IDF soldiers who are portrayed in a villanous manners - all of this has apparently sunk in at a deeper level than most people realize). 1 - It was a reference to Torah study etc. 3 - "the idea that being secular is worse than terrible suffering is morally repugnant... goes against fundamental torah views and values." Morally repugnant?! Do you believe that those who lived a life in suffering in order not to be over on certain morally repugnant.? Well I am sorry. 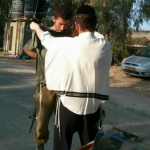 I saw chayalim doing situs masechet with their commanding officer before going into gaza. By flashlight in front of armored troop carriers. If they can learn at the front as soldiers then so can charedim. So I and many other bnei Torah and religious and traditional Jews and secular members of am yisrael simply view what you see as " a ciontribution" as rather shirking duty and detrimental to the physical - and spiritual and religious welfare of the Jewish people. Take out done Jewish history books and read. Preferably no charedi censored ones. You will be enlightened. You will discover that 150 years ago rather than everyone being charedi most Jews were simply that Jews. According to charedim there was somehow a poisoned well in Europe which caused millions of god fearing charedi Jewish women to give birth to apikorsim and mumarim. Magically. But that's not what really happened. That's fine for an individual to decide. But the problem with charedi ideology is that they extrapolate that to others. No one has a right to tell others that it is better for them to suffer or be dead than to violate the Torah. That is morally repugnant. Btw even the most extreme charedi ideologues were of the view that "moridin lebor veayno maalin" does not apply today. I think that karaim who live in Israel and serve in the IDF are members of am yisrael. In many ways perhaps even more so than certain charedim. I take strong issue with your statement that learning for the success of the IDF is not equal to serving in it. The Or HacChaim HaKadosh interprets "alef l'mateh alef l'mateh" as meaning that equal numbers fought and learned. Of course, it could be that the learners were too young or old or insufficiently physically fit but the idea is clear. Someone who really learns also contributes to the war effort just as do jobnikim (and all kinds of issues will lower a person's profile). I could see Chritopher Hitchens or Sam Harris having a field day by ridiculing fundamentalist values of kashrut, Shabat, and eternal life. From a religious perspective, what exactly do you (we) oppose in Rabbi Yisroel Yitzchak Kalmanovitz's stance? I can understand why Rav Kalmanowitz's statement that dying "al kiddush hashem" is not a bad outcome for a Chiloni, but as a flag bearer of Rationalism, I would expect you to articulate why his reasoning is faulty. I really regret reading this post. Shame on you spreading hate between Jews, particularly atvsucj a great time of unity. I saw the reaction of the chayalim when they received the food packages, I delivered them myself. The sense of achdus that was so clear, this post is just disgusting and demands an apology to the entire Jewish nation for attempting to cause deeper rifts at a time that things are finally starting to be mended.shame on you. Similarly, at the major rally held outside the UN in New York, the absence of black hats was quite obvious. When one woman in Brooklyn who belongs to the charedi community was asked about this, she replied that she hadn't heard anything about the rally at all. While that may be possible, certainly the charedi community on its own did not hold a rally. Given that they could muster quite a large group if they wanted to, their silence is disappointing to say the least. The Radak on the possuk "shefoch chamoscha al hagoyim".states that ot should never be said about a fellow Jew. If I were you, I would think twice before maligning the great tzaddik Rav Yisroel Kalmanovitz, of whom Rav Schach said that half the world exists in his merit. I personally witnessed him stand Shemoneh Esrei for one hour and fifty minutes on a motzoi Shabbos. His tefillos are unbelievable. From a different dor. He is a malach Elokim. To hear him utter the Sheim Hashem sends chills down one's spine. You should see Rav Eliezer Berland's tefillos.